Daffodils are blooming, the days are finally getting longer, and eggs are appearing in all form all over the county (Marmite flavoured chocolate anyone?). It can only mean one thing - Easter is finally here! Bristol’s got a lot going on this school break, so check out this Easter holiday guide to make sure you have an ‘eggcellent’ holiday this April. There’s no greater joy than a classic Easter egg hunt, but kids these days need a little bit more than painted eggs. 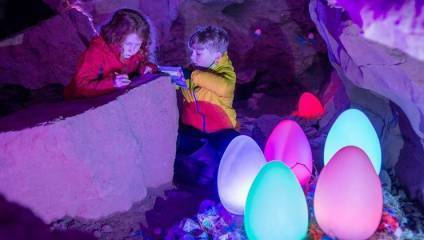 For an adventure with a difference, how about going to the glow in the dark egg hunt at Cheddar Gorge & Caves? 50 glow in the dark eggs have miraculously appeared in the Gough Cave, including one illusive magical golden egg! Crack the mystery code to win a yummy treat! Regular Easter eggs not enough? Noah’s Ark Zoo Farm has created an animal themed Giant Easter Egg hunt, which also features Easter arts and crafts, wooden egg decorating and (of course) free chocolate. The Easter Eggstravaganza at Berkeley Castle features eggs and dragons (a double whammy of fun), and if you’re not impressed by bunnies or dragons, then follow The Calmer Llama trail across Bristol. For older kids there’s a whole range of informative adventures to be had before you head back to school. An immersive experience is taking over the SS Great Britain, as the harbourside becomes a working Victorian dockyard. Stepping back in time to when the dockyard was building the famous ship, you’ll encounter the real-life smells and sounds of a working forge, as well as characters from the Victorian age. If the weather stays fair, then a wander around the Easter Sculpture Festival at the University of Bristol Botanic Garden is a wholesome afternoon out for all the family and includes special children’s trails and willow weaving workshops. For a day celebrating the history of chocolate then have a look at the Avon Valley Railway’s Chocolate Train, which sees the return of the old Fry’s Chocolate Factory steam locomotive, running under its own steam for the first time since 1964. Expect free chocolate for everyone, and lots of amazing info. Did you know that Fry were the first company in the UK to produce chocolate Easter eggs? Neither did we. For those kids who really want to get their hands dirty, Cooking It! cooking school is hosting special children’s cookery classes all throughout the holidays. From baking to cooking, help the kids build some serious skills whilst (hopefully) bringing something delicious home to eat. If you don’t trust the kids to do the cooking, then perhaps book in for a seriously regal three-course Sunday Lunch at Thornbury Castle. Check out the Sunday Lunch at No 4 Clifton Village for a modern twist on a beautiful traditional Easter menu, and let the kids take part in their egg hunt and face painting whilst you crack open a Sunday afternoon bottle of wine. Or if having lunch on solid ground isn’t good enough for you then take the cream tea Harbour Trip on The Matthew. A 1 ½ hour sail accompanied by cream scones and freshly baked cakes, what’s not to love? For more info head to Visit Bristol.